Staying fit while traveling for business can be tough. Early mornings and late nights. Who wants to go to the gym at 4 or 5 in the morning? Not me. Raise your hand if you’ve had every intention to workout while you were traveling…you packed all the gear, your running shoes, your workout clothes and what ever else you think you might need. I know I have; only not to have used any of it. It actually makes you feel bad. Well, now I only pack a few things – maybe for 2 days and I get up early in the morning and go exploring (insert less guilty feeling). 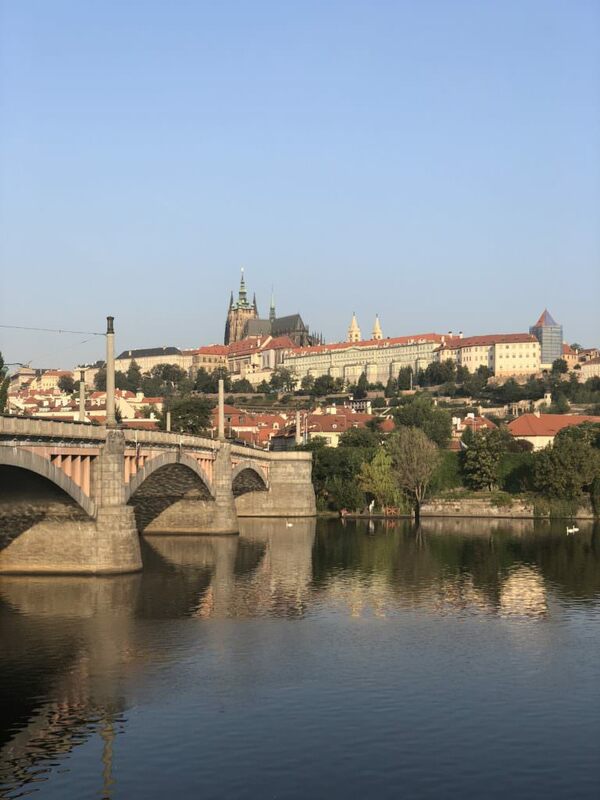 I was in Prague a few months back and with the time change, I was up at the crack of dawn so I thought this is the perfect time to see some of the sites with no tourists around. 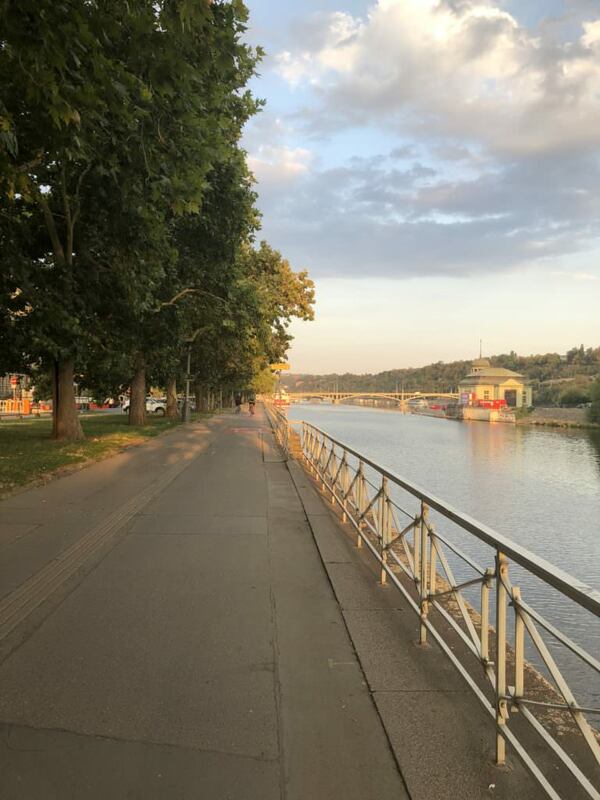 Prague is such a walkable city, so why not take advantage of it and stay fit at the same time. Isn’t walking suppose to be one of the best forms of exercise? 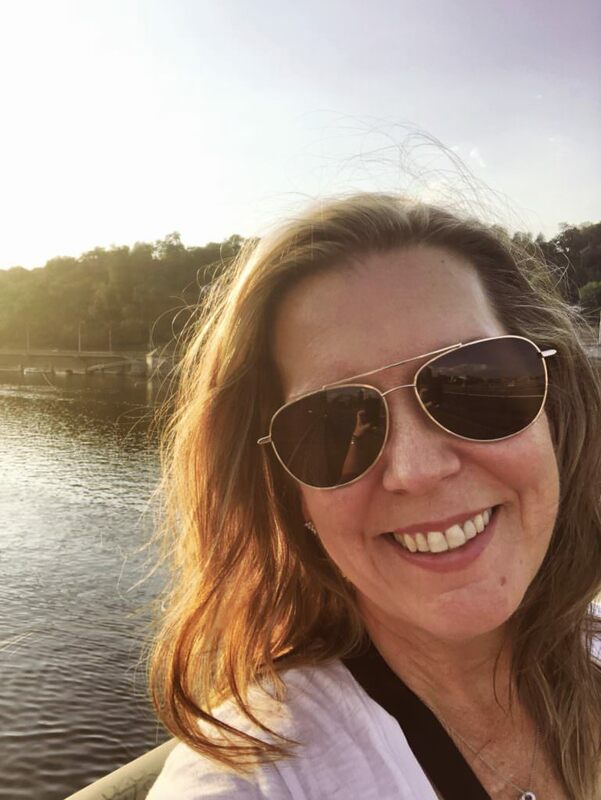 Shameless selfie along the river in Prague during an early morning walk. A view of the castle in Prague during an early morning walk. This area is normally packed with tourists, but I had the area all to myself. Early morning walk from the hotel to the city center. Nothing like watching the sun rise and the fresh air. Some of you might love to get your heart pumping and if you follow me on instagram (which you should 🙂 ) and watch my stories, you would know that I have a super love for Orangetheory. 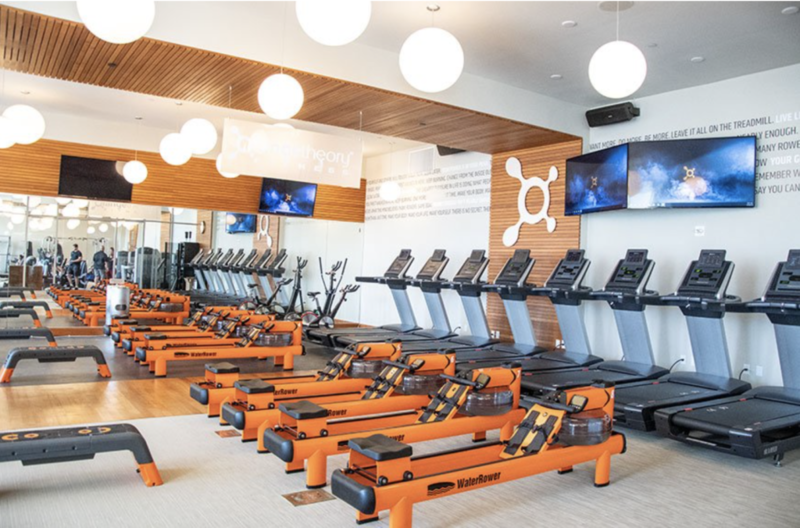 For those of you who don’t know what OTF (Orangetheory) is, it’s kinda like a HIIT workout. You either start on the rower or treadmill (I’m treadmill #14) and you workout 23 minutes on the tread and if you start on the rower – you move to the weight room. I miss my OTF when I’m traveling – like I crave it and can’t wait to get back to it. Staying fit has kinda become an obsession for me. So how excited was I when I saw they were creating pop-up shops within hotels. You see there are a crazy amount of OTF’s all over the world and the amazing thing is you can go to any of them with your membership. But for me, that is something really hard to do especially when working events. The first one is popping up at the Boca Raton Resort in Florida. Makes sense because OTF’s corporate headquarters are in Florida. Now one thing that will be different is that if you are a member, you need to pay for the class. It’s only $20 vs $30 for non-members. Personally I think it would be worth it because I can get in amazing workout in less time it would take to get to a local OTF. The plan is to open 12 in 2019. We’ve all seen group yoga classes or a group fun run as part of a conference. I think it would be great to add a HIIT class option that would get everyone’s heart pumping. Did you know that you could reach out to a local OTF or fitness center and ask them if they have a coach that would want to teach a class? Basically, the options are endless. Go for a walk and explore, use an app (Beach Body on demand or Sweat with Kayla), or if you’re lucky and have an OTF in your hotel, you can do that. The goal is to move your body and stay fit while you are traveling and not beat yourself up if you don’t wear your workout gear. I’d love to hear from you. What do you do to stay fit while traveling?